Everybody’s favorite Italian plumber is back! Consider the Good Smile Company’s Nendoroid Mario, a six-inch figure set with all the fixin’s. It’s like he’s real with his varying smiling and serious facial expressions, and if that isn’t enough, you can jump right into a scroll-screen world of your own with the added coin, block and Super Mushroom accessories! “Dash” parts for when he’s running and “brake” additions for when he stops are topped off by the included background display. “Bad guys” Buzzy Beetle and Boo can be used to re-imagine all of your favorite scenes from the SNES days! As a bonus, crossed-arm parts for the Nendoroid Luigi are included so you can display them together easy as pie. With this set, you’ll truly be all set. It’s-a Mario, and all of his friends, too! Get ready to decorate any “blah” space with this poster based on the aesthetic and characters of the legendary Nintendo game Super Mario World. From Boo and Goomba to Bowser and Princess Peach, the gang’s all here and set to add a dose of color to your world. This poster from Pyramid America measures 24 by 36 inches, sure to make the perfect centerpiece of any hideout. Hop into the nearest green warp pipe and pick one up! Mario seems to get all of the attention at times. His bright red garb and lovably pudgy form have inspired waves of nostalgia and fondness in more than one generation of gamers. But what about his green-outfitted counterpart, the swift and quirky Luigi? Tamashii Nations/S.H. Figuarts totally get that this world needs an equal dose of Luigi as it does Mario, and they’ve knocked it out of the park with this new playset. Complete with brick block and red shell accessories, the four-inch Luigi figure also comes with interchangeable hand parts to hold the shell. An exclusive display stand with support arms allows the Big L to be displayed as he deserves to be. Precise articulation allows him to be used to recreate scenes with the S.H. Figuarts Mario, also available on CmdStore.com. Jumping into warp tubes, smashing Goombas, taking names. Want a Mario-and-Luigi-themed laugh on your lunch break? 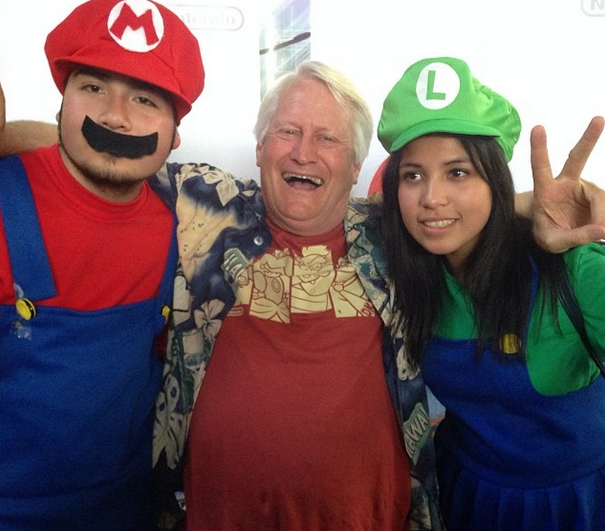 Okay, so apparently Charles Martinet (the voice of Mario, Luigi, and other characters from the Nintendo franchise) has an Instagram account where he carries around action figures and does voice-overs for their real-time adventures. And we can’t stop chuckling. In what could arguably be the most awesome crossover battle ever, Mario sees himself confronting none other than Darth Vader. And he doesn’t stop there — Mario and Luigi consort each other over a boiling pot of soup, encounter horses on the beach that they mistakenly identify as cows and become replacement juggling balls for a street performer. Follow our man Charles here and let the hilarity ensue. Mushrooms and bananas and warp tubes, oh my! So what do these three things have in common? Recall cherished memories of third- and fourth-generation gaming consoles like the NES with this brand-new wave of figurines inspired by the Super Mario and Donkey Kong franchises! From Jakks Pacific comes the World of Nintendo series, and they’ve stocked their lineup with a bevy of adored characters. From Mario to Yoshi to Kong, these figures range in size from 2 to 6 inches. Wave one will be available for shipping as soon as November, so preorder now! Still beaming that same smile after all these years. Mario, you’re a gem. Koopas have it rough. Like Shyguys and Goombas, they almost never get their story told and usually end up on the wrong side of Mario’s boot, fireball or flashing, invincible body. And now, with today’s TeeFury shirt, they’re about to get kicked…again. So grab the figure above, snag the t-shirt below and join the Koopa Troop– they could really use some help.